Three Broadway producers struggling to get backing for their show hope one's sudden inheritance of a half interest in a Parisian fashion house is the answer. They travel to Paris only to learn the salon is in debt and requires their help. Just one of many films that 1952's "Singin' in the Rain" owes a major part of it plot premise. 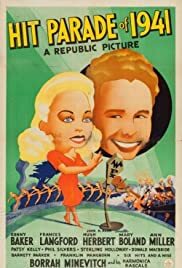 Republic Pictures cut 28 minutes from this film's original running time of 88 minutes and reissued it in 1952 (no less) as "Romance and Rhythm." A lot of the cuts involved Ann Miller's dancing and left a lot of the film's rhythm out of the edited film even if it was included in the new title. The unedited plot found independent radio station WPX losing its important ad accounts to network stations and is about to go belly-up. One of its most important accounts is the Farraday Trading Post, a "swap shop" in a Connecticut suburb. Ferdinand Farraday (Hugh Herbert), entirely devoid of business acumen, accepts the decree of his nephew, David Farraday (Kenny Baker), that their sponsorship of a radio program be discontinued. Station manager Harrison (Donald MacBride) rushes to Wyndham Ferry, flanked by two of his singers, Pat Abbott (Frances Langford) and Judy Abbott (Patsy Kelly), to save the account. Harrison quickly sizes up Uncle Ferd as an unqualified screwball and contrives to trade his insolvent station for the Farraday Trading Post. Television takes the country by storm (in the film, at least, and was about to in the real world if World War II hadn't put it on hold for the duration)and all radio stations, if they are to survive, are obliged to install expensive television equipment. Uncle Ferd borrows money and places the Wyndham Trading Post, which he no longer owns, as security. This makes it vitally necessary for the Farradays to make the station profitable within the ninety-day period of the loan. Mrs. Emily Potter (Mary Boland), a Brooklyn department store tycoon (tycooness? ), is persuaded to sponsor a television program, but only if her daughter, Annabelle (Ann Miller), be starred as a singer. Annabelle can dance up a storm on legs that stretch from Monday to at least Friday but singing is not one of her many attributes. No problem. David persuades Pat to supply the singing voice, while Annabelle appears on the television screen, singing into a dead mike. Annabelle becomes a big singing star and Pat is okay with this because she loves David. But, for publicity purposes, David must be seen in public frequently with Annabelle, and he thoughtlessly breaks dates with Pat to do so. Sister Judy is indignant but Pat refuses to expose the hoax. So Donald O'Connor....uh...sorry...make that Judy, taking things in her own hands, switches controls during Annabelle's telecast, and Annabelle's real voice is heard. The jig is up but no harm, no foul for all hands. Pat becomes a singing star and Annabelle a show-stopping dancer. And any film with a cast that includes Phil Silvers as a brassy radio announcer, crying-voice Sterling Holloway as a philosophical soda jerk, prissy-as-usual Franklin Pangborn, Barnett Parker's English-variety humor ( beg pardon, humour), ditzy Mary Boland, little Annie Miller's dancing and Frances Langford's singing is a keeper. At least, in the original 88-minute version. A whole lot of the above is missing in the 60-minute "Romance and Rhythm" version.